photo via the blog Saving The World One Cupcake at a Time, where Miss Dot applied for a job and is giddy with excitement over this new cupcakery. 1951 East La Habra Blvd. 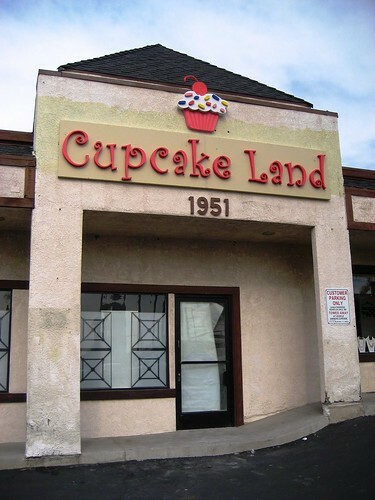 I was so excited when i read the article about Cupcake Land in La Habra. I really thought it would be nice to support a lovely new business in La Habra so i planned for my Wedding Cupcakes to be done by them BIG BIG MISTAKE. 1st, there was no one available to provide the flavor options when I entered (new business is unorganized so i overlooked it) and the only person who can discuss orders is the proprietor Sandy Luna. She is very hard to get ahold of, I went into the store 3 times and left two phone messages over 1 1/2 weeks before she called me, she then said she had just gotten the message even though 2 employees each told me they had personally handed her the message. She should just apologize for not returning the call, don't make your employees look like liars to save your own face. Highly unprofessional. We met with her, discussed the cupcakes and the price. Some cupcakes were to be filled and some were to be dairy free for my husband and his relatives who cannot eat dairy. However NONE of the cupcakes were filled and they were all displayed together so if there were dairy free ones there was no way to tell. Upon delivery they also overcharged and, along with my mother in law, caused a scene at my wedding and threatened to stand in the way of the procession if they were not paid. We also orered a large cake sized cupcake for show when we cut the cake and it fell apart under the first cut!! Very very poor quality and service!! I suggest finding another more professional establishment. Dishonest and unprofessional is an understatement. but I am glad her company failed if anyone deserves it its her...we understand times are tough but her actions are childish and unprofessional. Small businesses like ours cannot not afford to take such financial losses as this one the money we lost from hit us pretty hard. We are very grateful for the work we do have and thank God for the honest people he has put in our path but remember sometimes the bad come in many forms such as Sandy Luna!! !